Google Pixel 2 XL - Will it challenge iPhone X? Google Pixel 2 XL smartphone was launched recently amid much fanfare. However, its biggest challenge is to stand against the iPhone X which is Apple's flagship weapon from the latest arsenal. The phone comes with a 6.00-inch touchscreen display with a resolution of 1440 pixels by 2880 pixels at a PPI of 538 pixels per inch. 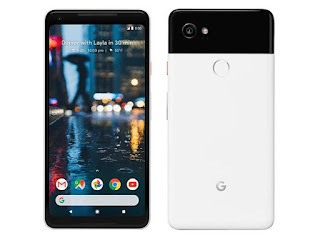 Google Pixel 2 XL price in India starts from Rs. 73,000. As opposed to this, iPhone X has been priced around Rs 1lac. However, there are a few features which make both phones unique in their own way. The Google Pixel 2 XL is powered by 1.9GHz octa-core Qualcomm Snapdragon 835 processor and it comes with 4GB of RAM. The phone packs 64GB of internal storage that cannot be expanded. As far as the cameras are concerned, the Google Pixel 2 XL packs a 12.2-megapixel primary camera on the rear and a 8-megapixel front shooter for selfies. The Google Pixel 2 XL runs Android 8.0.0 and is powered by a 3520mAh non removable battery. It measures 157.90 x 76.70 x 7.90 (height x width x thickness) and weigh 175.00 grams. The Google Pixel 2 XL is a single SIM (GSM) smartphone that accepts a Nano-SIM. Connectivity options include Wi-Fi, GPS, Bluetooth, NFC, 3G and 4G (with support for Band 40 used by some LTE networks in India). Sensors on the phone include Compass Magnetometer, Proximity sensor, Accelerometer, Ambient light sensor, Gyroscope and Barometer.